'New Routemasters' ('New Bus for London' name seems to have been dropped) coming to route 148 on Saturday, but without the hop-on hop-off option. Witnesses describe a fatal hit and run that happened in Newham last week. A speeding driver who killed a child has had his sentence halved to 12 months. Barnet Hospital A&E had to turn away ambulances on 31 January after becoming overwhelmed by patients. 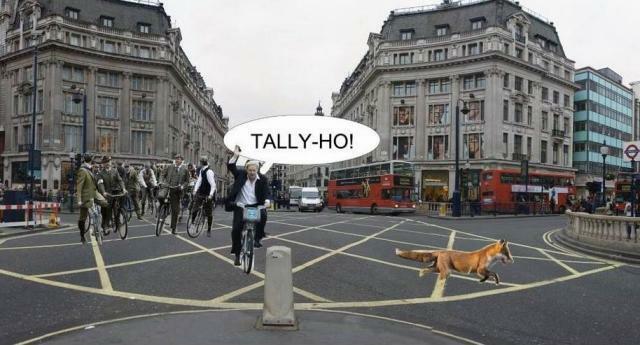 Boris Johnson tweets support for London foxhunting. Which prompted James David Smith to send us this image by his friend Katie Stotter. Damon Albarn announces gigs at the Rivoli Ballroom and People's Palace. Architects design water fountains for six potential locations. The Thames Barrier has been closed 33 times so far this winter. It closed 35 times during the entire 1990s. Thames is predicted to rise to its highest level in 60 years. Concerns that central London could be at risk of flooding in the future.